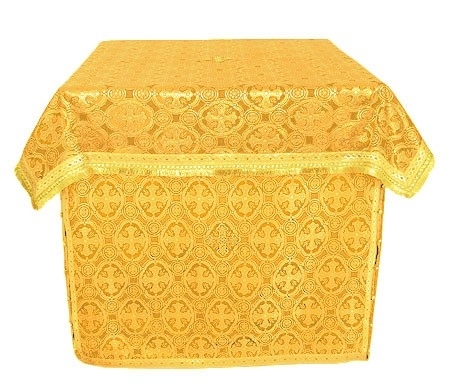 Orthodox Church liturgical Oblation table vestments (yellow-gold) by Istok Church Supplies Corp.
Istok Church Supplies makes it easier for Orthodox Christian churches to purchase Oblation Table vestments that match the day and liturgical season. In this section, you will find high quality and affordable yellow-gold Oblation Table vestment that can be tailored to your specific requirements of fabric, decoration and measurements. Our resplendent yellow-gold Oblation Table vestments are sure to brighten your church liturgical service and draw the attention of church goers to the Holy Altar. A vested Oblation Table is a prime requirement for the Divine Liturgy and we can help you fulfill this need. Our Oblation Table vestments are full coverings and made from exquisite ecclesiastical fabrics like rayon brocade and metallic brocade. Customers can select their desired fabric (belonging to the same class as mentioned for the product) from the Fabrics section of our website and mention it during check out. We offer Economy decoration free of cost but customers who wish to upgrade can select Standard or Premium decoration for an additional cost. Customers can also add natural velvet inserts to their order for an extra cost. Customers who do not wish to face the disappointment of purchasing an ‘off-the-rack’ vestment can provide us with the exact measurements of their Oblation Table. Our expert tailors in Europe will create a made-to-measure Oblation Table with immaculate stitching and fit. Customers will not be disappointed with our prices, especially when they experience the quality of our products. We strive hard to offer affordable pricing – this along with our member rewards program can lead to significant price savings. We offer delivery services by land and air. We have widespread experience in delivering to major countries in North America, Europe and Australia. Having said that, we encourage early order placement, especially during peak season, to ensure timely delivery. Our convenient online Orthodox Christian goods store is open 24/7 - shop now and discover fabulous Oblation Table vestments! The vestments I orders are gorgeous and very well designed. I would like to congratulate you for the excellent service.